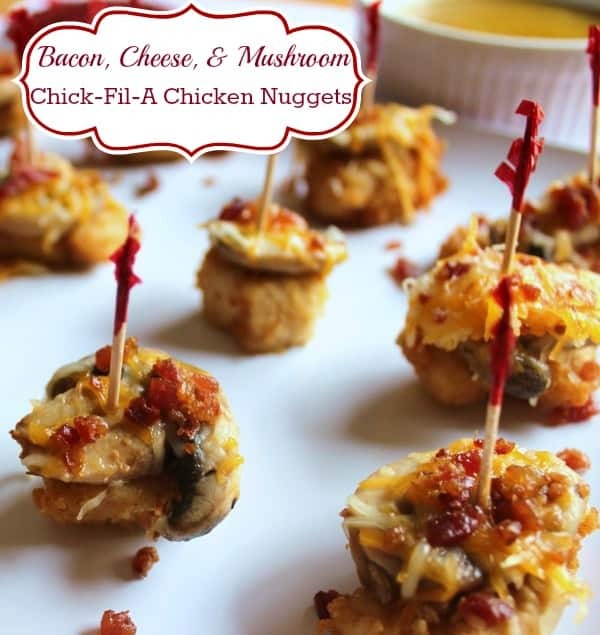 Here is a semi-homemade recipe that I put together, with the help of my friends and family (particularly my nephew Austin), using Chick-Fil-A chicken nuggets: Bacon, Cheese, & Mushroom Chick-Fil-A Nuggets. Semi-homemade means that you skipped some steps by buying something already made and then adding to that already-made item. Saves so much time without skimping on the taste! 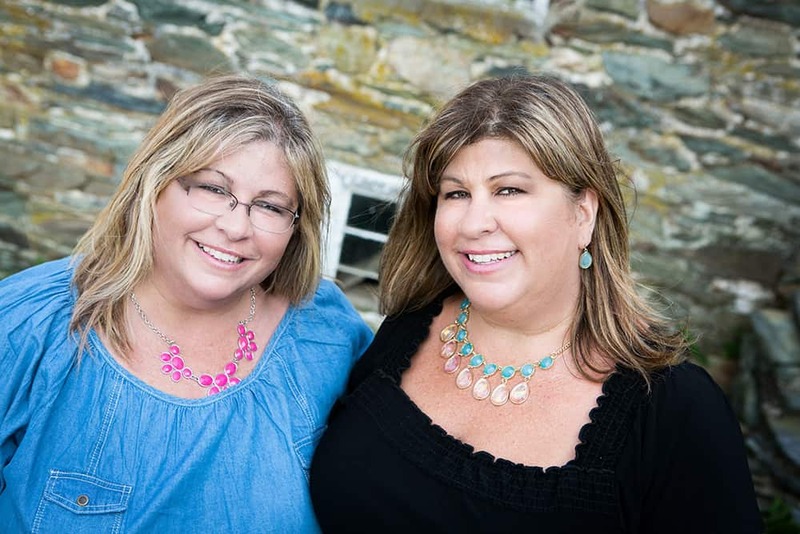 Being a blogger and a mom, I am what is termed a ‘Mom Blogger’. We ‘Mom Bloggers’ are approached with opportunities to express our opinions regarding different brands. It’s so much fun! And, hey, we mommas totally know what we’re talking about! 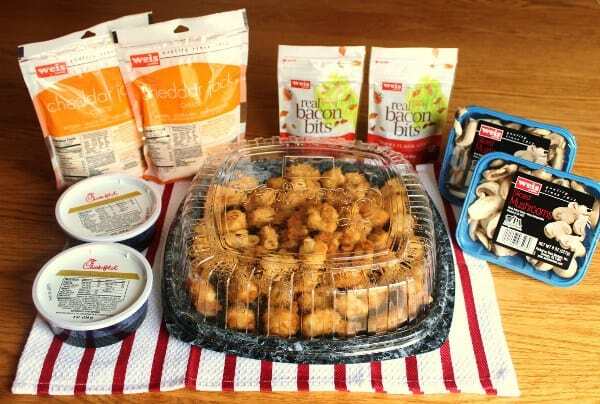 So when I was chosen along with a little over 200 other ‘Mom Bloggers’ across the country to be a part of the 2014-2015 Chick-Fil-A Mom Panel #ChickFilAMoms, I was totally ecstatic! Ask Terri. I really was beside myself. We get to give our opinions on topics that Chick-Fil-A wants to know about regarding what our kids like and what we like as well. 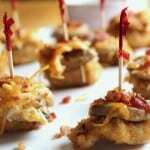 We were recently given a challenge to “Dress Up Your Nuggets” and share our recipes with our readers. At first I really wanted to go with the holiday theme by involving something cranberry related. 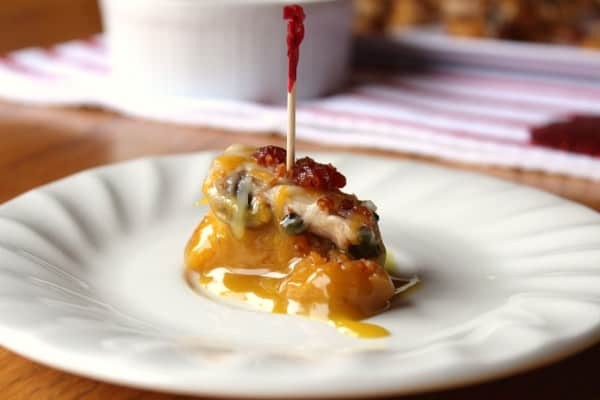 I got some Orange-Cranberry Chutney and chopped walnuts, sliced a Chick-Fil-A chicken nugget in half, spread the chutney and sprinkled the walnuts, added the other chicken nugget half on top, and stuck a toothpick through it. It was really very good! 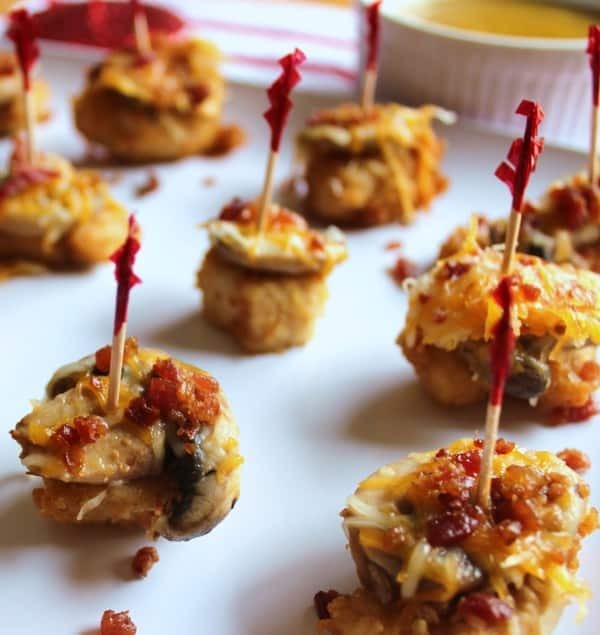 But after getting others’ opinions, the overall consensus was that these Bacon, Cheese, & Mushroom Chick-Fil-A Chicken Nuggets would appeal to a larger audience. I will take you on a little step-by-step photo journey of how to make them. The printable recipe will be at the end of this post. 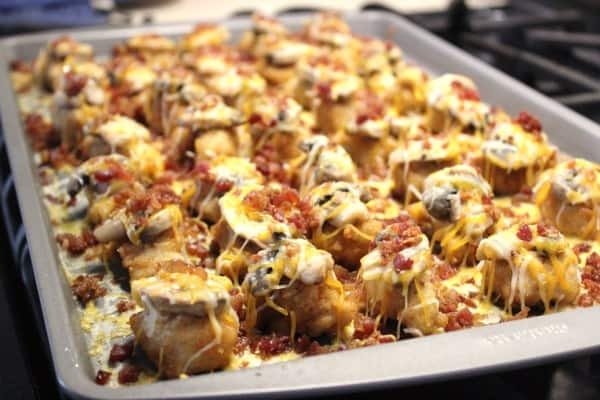 You will need Chick-Fil-A Chicken Nuggets, Chick-Fil-A Honey Mustard Sauce, shredded cheddar jack cheese, real bacon bits, sliced mushrooms, cooking spray, & butter. Spray a large cookie sheet with cooking spray. 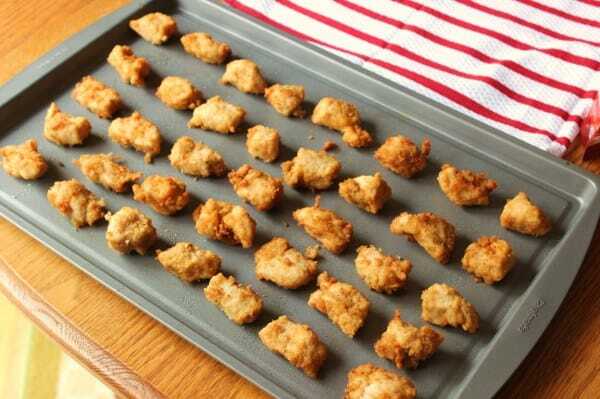 Spread out the chicken nuggets onto the cookie sheet. In the meantime, add a tablespoon of butter to a frying pan over medium heat. After the butter melts, add the sliced mushrooms and about 1/4 cup of water and let the mushrooms cook until they are soft. Should take about 10 minutes or so. Then drain the mushrooms. 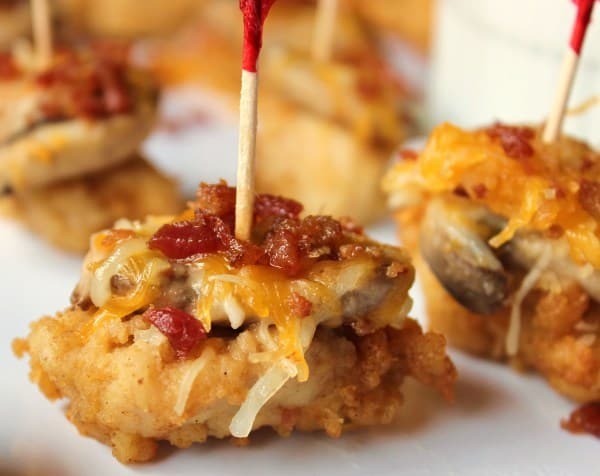 Place one sliced mushroom onto each chicken nugget. Sprinkle the shredded cheese evenly over all of the chicken nuggets. Sprinkle the real bacon bits evenly over top of the cheese. Bake in a 350 degree oven for 5 to 10 minutes. 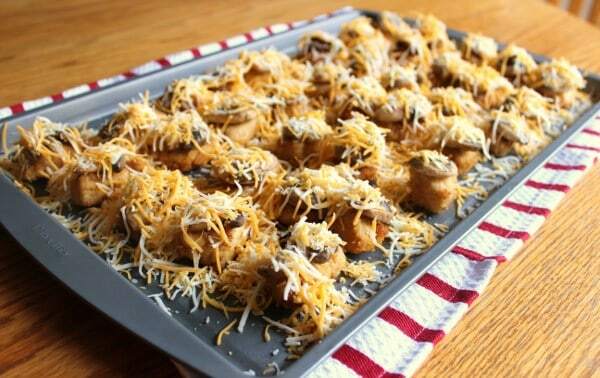 Melted cheese will be all over your cookie sheet, but because you used cooking spray, it is very easy to lift off. Use a small cookie spatula to lift the nuggets off of the cookie sheet and onto your serving platter. Pour the honey mustard sauce into a dipping bowl. Stick a toothpick through each chicken nugget. My husband totally ignored my pleas to wait until I was finished taking pictures before he dug his hands into these chicken nuggets and began eating them. They were so delicious! If I had more time, here are some changes I would make: Use sliced cheese instead of shredded cheese. Instead of using bacon bits, cook the bacon yourself until right before it starts to become crispy and break it up into squares. 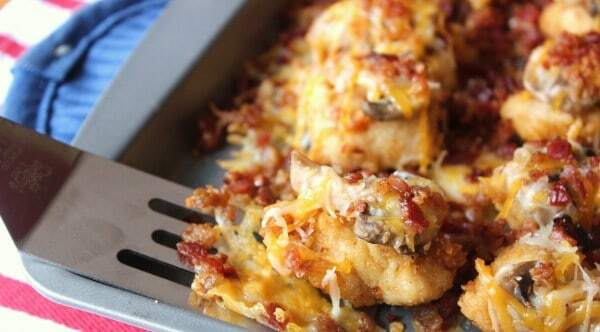 These changes would have kept most of the cheese and bacon on the nuggets while cooking. But if you’re short on time, like I usually am, shredded cheese and bacon bits are absolutely fine to use. I also think that next time I will add sliced spring onions on top of the nuggets. I think that would give it a little bit of a crunch and added flavor. 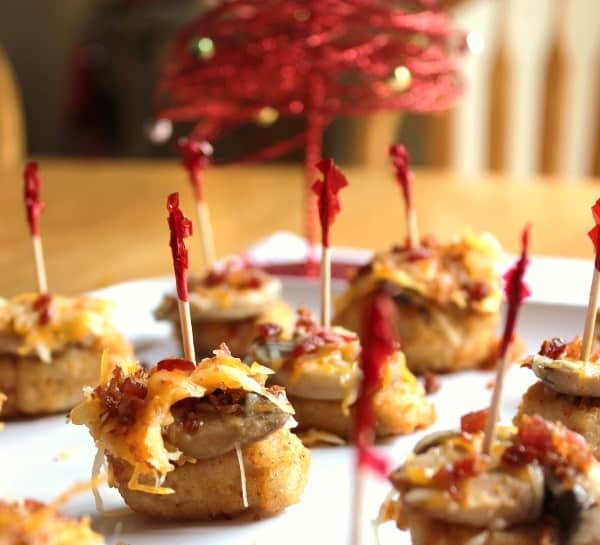 The combination of the delicious Chick-Fil-A chicken nuggets with the sliced mushrooms, cheese, and bacon was heaven on a toothpick. 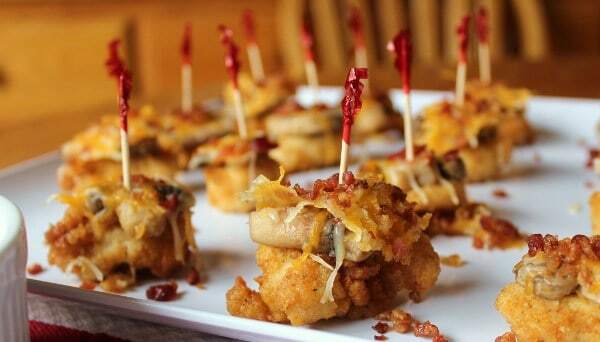 I would consider this a relatively heavy appetizer. Eat 2 or 3 and you’re pretty satisfied. And here is the final product after being dipped in the honey mustard sauce and ready for me to eat. My pictures were taken and it was now time to enjoy the fruits of my labor. 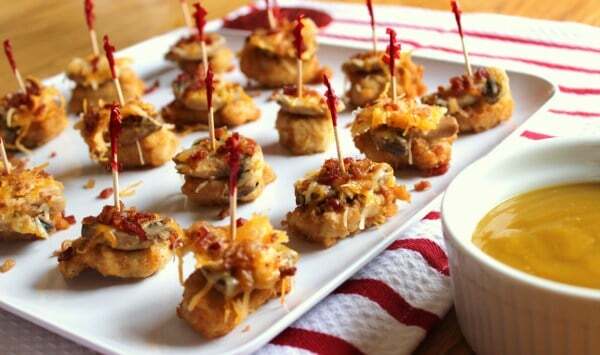 This would be the perfect appetizer to bring to a holiday party or even to serve at home on a football Sunday. 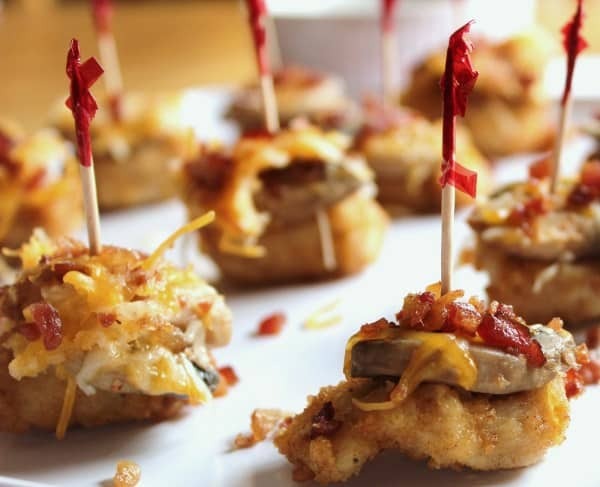 Thank you Chick-Fil-A for inspiring me to think out-of-the-box and come up with this recipe. Oh, and thank you to my nephew Austin, who is the most creative 15 year old I know. - 8 oz bag shredded cheddar jack cheese - if you have more time used sliced cheese broken into smaller squares. - Real bacon bits - if you have more time cook your own bacon before it gets crispy and break into smaller squares. 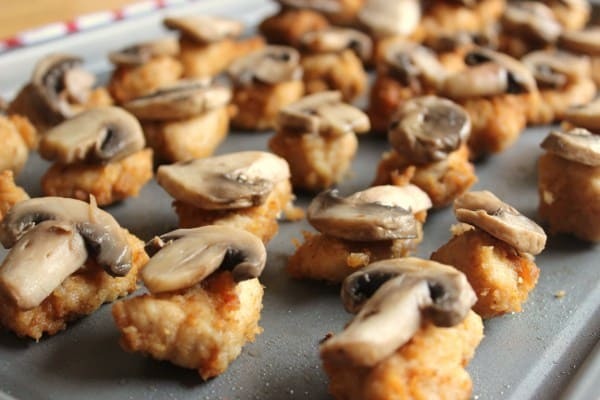 Spread out the chicken nuggets onto the cookie sheet. In the meantime, add a tablespoon of butter to a frying pan over medium heat. 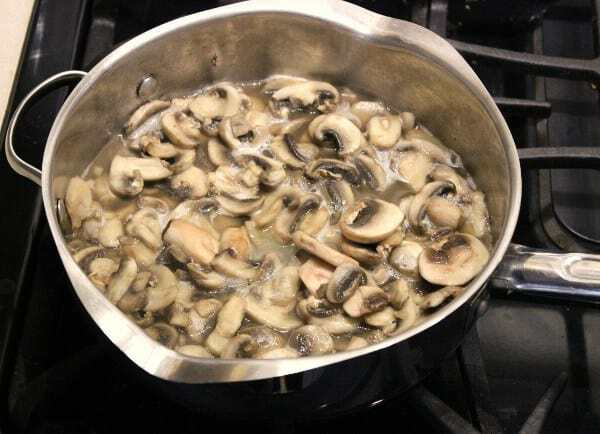 After the butter melts, add the sliced mushrooms and about 1/4 cup of water and let the mushrooms cook until they are soft. Should take about 10 minutes or so. Use a small cookie spatula to lift the nuggets off of the cookie sheet and onto your serving platter. Pour your honey mustard sauce into a dipping bowl. Stick a toothpick through each chicken nugget. This looks awesome Pam. Right up my alley. 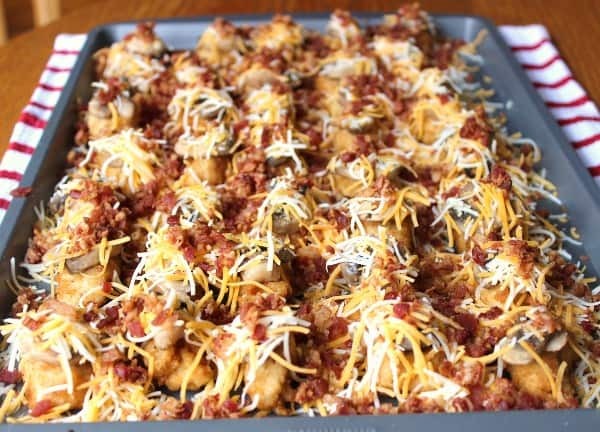 You’d better make them for this Sunday’s Nascar Championship party!!! “Mom Panel;” that’s pretty neat; I didn’t know that!!! 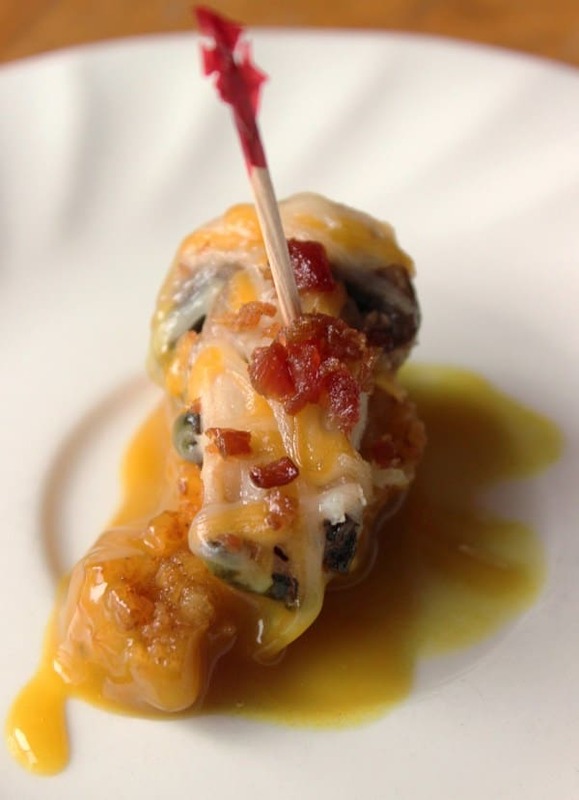 The pictures made me drool–looks so delicious and probably feeds a crowd! I wish I hadn’t looked at it before dinner!! I wish there was a Chick-Fil-A near us!!!!!! It’s a lot of fun Cheryl! I love giving my opinions and we get coupons every so often from Chick-Fil-A. Their chicken really is the best.